I'm with Ray, Thai_1_On--post a photo of a Tiger Girl! I've yet to actually see one, so to me, they're as rare as any fireball, and probably much more riveting to the eye! And maybe on the rare day that I'm actually seeing a Tiger Girl, I'll be having a beer at the same table as Brian--who knows? There were darn sure some lookers at tht bike show today, in the guets the waitreses and entertainers. You did'nt tell them, afterwards?? I thought you wanted a bit of excitement?? Garnet wrote: And maybe on the rare day that I'm actually seeing a Tiger Girl, I'll be having a beer at the same table as Brian--who knows? But at least you thought of it, so I'll credit you for that attempt! I'd probably have been too timid to try and photograph her to best advantage--more likely I'd try a distance shot that would be too small to appreciate afterwards. The guy form out of town wanted excitment, I enjoyed the people watching. We left a 9:00 because I had something that I wnted to do to today. So there was more then likely a lot more to watch later on. I enjoyed seeing true choppers there were a few and they were really done well. Man those Gold Wings just have me drooling. The event was done very well, since this was the first I hope there was enough attendance that there will be a second. Phon Phisai is not the only place to observe the phenomenon. 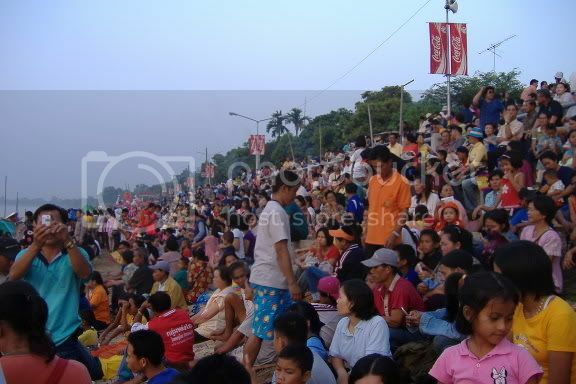 Over in Lao the folks go east of Vientiane about 70km and swarm the banks of the river there.. The Thai side does the same. There are a number of places up and down the Mekong near Nong Khai where folks swear the fiery balls come up. I've read the fireballs are actually gas bubbles that phosporece (sp) as they come to the surface of the water. it happens (supposedly) in the full moon in late October. The speculation is that the gravitational pull of the full moon (Why only in Oct I wouldn't know) causes the gas to come up at various places along the river. I've read in Rough's guide that there's another village over near Loei where it happens in a large lake or Beung.. The larger and large crowds has come from the big push for the last 4-5 years by Tourism Authority of Thailand and their "Thais visit Thailand" program that has advertised this event widely. Of course, having good highway all the way up from Bangkok allows a heavy footed city-dweller to get up to Nong Khai in 7 hours or so.. 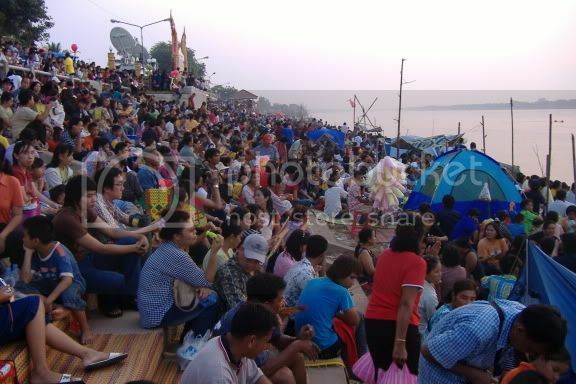 Thus, we now have thousands swarming up to the river for this festival as well as them visiting all the parks locally.. Nothing like seeing a Krungthep Maha Nakon license plate on a BMW, Benz, or Vonvo, and the man jump out wearing his "back to my roots" Pakomah tied around his waist so he'll fit in with his Isaan cousins. So it's supposed to happen sometime during the full moon in late October? Would it be adviseable to book a bungalow along the river at this early date (I realise it isn't Thai style to plan in advance, but what can I say, I'm not Thai)? Anyone had any experience with Pantawee Resort in Nong Khai, bungalows on the river. Would their location make for good viewing? Someone recommended that location on the site before. If you want a room on the river you better book it now, you maybe to late already. Some people from bangkok book them a year in advance. I called and spoke to a english person there last year but my trip didn't come together. Here's an idea of what kind of crowds you can expect I was a little bummed out because I only saw about 3 fireballs last year.